From doughnuts and bacon, floral-themed foods that would make gorgeous edible bouquets. At this point, giving your S.O. a bouquet of red roses is so expected that it's practically insulting. Still, that puts us all in a tough spot, because it's hard to deny that roses are inherently both a) lovely and b) romantic. We've got some options here to solve your romantic gift-giving needs. After all, if you give a rose-shaped food, you get to give roses while still being creative about it. It's summer, so if you bought someone a rose-shaped gelato cone, you'd have at least four things going for you: it's refreshing, it's delicious, it's creative, and it's super pretty. The problem is, you'd have to be in Sydney, Australia to get this particular cone. But you can always try to make a DIY ice cream rose, then you'd have five things going for you. For those of us based in New York, there's a more local option for rose-shaped sweets. The Doughnut Plant's Dough Flowers are glazed yeast doughnuts shaped into a gorgeous rose. 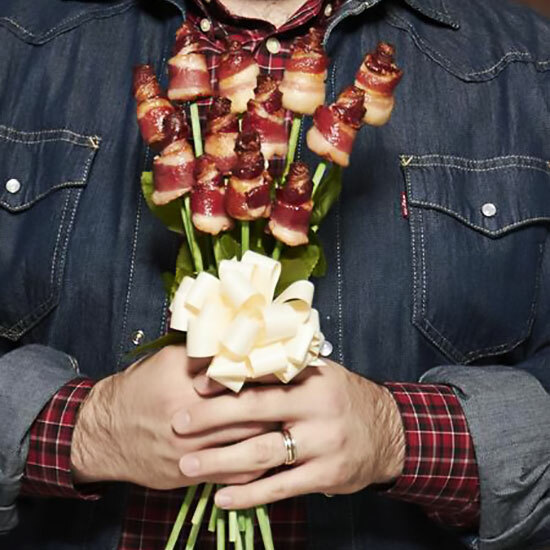 Waking someone up with a delicious breakfast prepared just for them is almost as romantic as a bouquet of roses, and with the Bacon Bouquet, you can do both at once. If you're going for something a little more delicate, you'll probably love these apple roses, which you can make with thin slices of apple and a bit of puff pastry. For a nutritious and versatile option, you can rose-ify almost any meal if you just learn how to make these carrot roses. They can make pretty much any salad, sauce, or garnish look way more romantic. Slices of potato have never looked better than when shaped into a rose and covered in cheese. Or, for another starchy, cheesy option, you can learn how to make this rose-shaped bread filled with gooey cheese. These cupcakes are super gorgeous, but even more satisfying to look at is the process of them being frosted. You can find the full recipe and video here.